This past Sunday I was up to the Cottage to review progress. The taping and plastering was complete. I was a great job! Here is a picture of the finished product - this is in the larger bedroom in the basement. 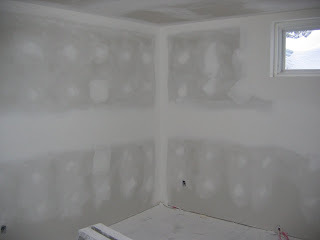 In this picture you can see that the drywall was installed horizontally. This may seem counterintuitive given that the drywall is 8-foot long and the ceilings here are 8-foot but this creates the best look, strongest bond, and the least amount of plastering. The sanding process makes one heck of a lot of dust as you can see in the picture - on the floor and the shorty step ladder in the foreground. It was great to see the finishing of the inside coming to an end! Next step is priming the drywall.